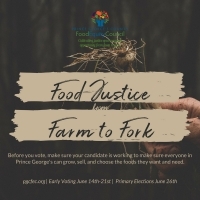 The mission of the Prince George’s County Food Equity Council is to significantly improve public health and community well-being of all who live, work, study, worship and play in the County. It will develop and support policies, approaches, procedures, practices and initiatives to create systemic change to the local food system, promoting health, economic opportunity, food security, and well-being, especially among communities that have been negatively impacted by the current food system. 2018 Candidates: How do you plan to improve our County's food system?